The cherry blossom season is coming in South Korea! In Korean, cherry blossom is called 벚꽃 (beot kkot). In this blog post, I will talk about some interesting Korean events, food and song related to cherry blossom. One internationally well-known event is the Jinhae Gunhangje (진해군항제 – Jinhae Naval Port Festival). Jinhae is a naval port in Changwon city in South Korea and is well-known for the abundance of cherry blossom – once you arrive at Jinhae, you do not need to look for cherry blossoms since cherry blossoms are grown nearly everywhere in Jinhae. The Festival was first held on 13 April, 1952 as a small-scale ceremony commemorating Admiral Yi Sun-shin, the Korean national hero who successfully defended Korea against the Japanese army. You can read more about Admiral Yi Sun-shin in my blog post dated 1 December 2014. Over time, the Festival has grown into a well-known event which attracts about 2 million visitors each year. Every year, the Jinhae Gunhangje is held during the cherry blossom season – usually from 1 to 10 April but the dates may change according to the blooming condition of the cherry blossom (for example, the Festival was held from 30 March to 8 April in 2005). During the Festival, there are arts and culture performances and street stalls selling different kinds of food and goods. Moreover, during the Festival, you may visit the Republic of Korea Naval Academy and the Command of Naval Base which are usually not open to the general public. 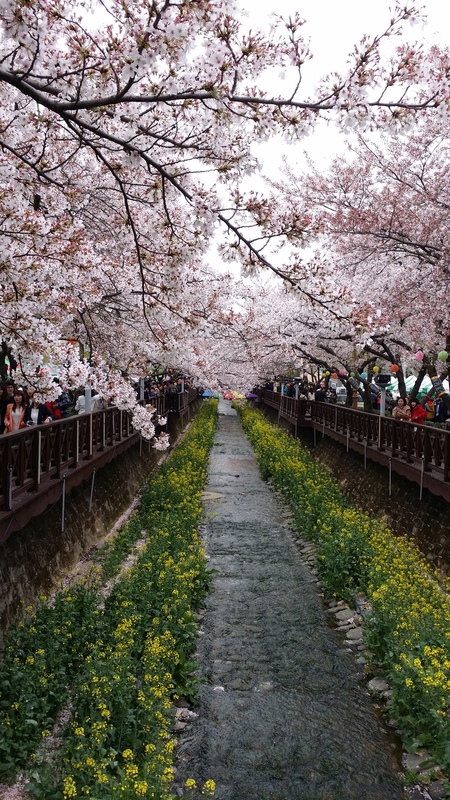 Of course, the most important thing to do in Jinhae is to watch the cherry blossom – two “must-visit” well-known cherry blossom spots are Yeojwacheon Stream (여좌천) and Gyeonghwa Rail Station (경화역). Yeojwacheon Stream spans about 1.5 km and is lined with cherry blossom trees which create a canopy over the stream, providing good photo spots for the visitors. In the evening, the lights along the stream are lit up which make the scene even more beautiful. In this stream area, there is also a bridge where the two leading characters of the Korean TV drama, “Romance”, met when they came to Jinhae for the Jinhae Gunhangje. After the airing of the drama, the bridge has become known as the “Romance Bridge” and is a popular tourist spot. Gyeonghwa Rail Station is a small railway station which has discontinued services since 2006 but trains still pass by this station (though at a very slow speed because of the large number of tourists there). It has become a hot tourist spot because of the abundant cherry blossoms which grow along the 800-metre railroad. The tourists may stand on the rail tracks to take pictures while there is no train passing by. It is really amazing to see a lot of cherry blossom petals falling like snow as the train sweeps slowly past the station. As Yeojwacheon Stream and Gyeonghwa Rail Station are very popular tourist spots, if possible, go there in the morning when there are still not so many tourists. In the afternoon, these places are packed with tourists and it is difficult to find a place to take photos. If you have time, you can also visit other spots and events in Jinhae. For more detail, you can refer to this webpage of the Korea Tourism Organization. If you like sports, you can participate in or watch the Gyeongju Cherry Blossom Marathon (경주벚꽃마라톤) which is usually held in the first week of April annually. This year, it is held on 1 April, 2017. There are full, half, 10 km and 5 km courses. There are beautiful cherry blossoms along the marathon course and participants can enjoy the beautiful scenery while running – that’s why it is popular among the marathon runners. For more detail, you can visit this website. In Jinhae, you may find many street stalls selling different kinds of Korean food (like roasted pigs, stuffed squids, Korean pancakes, etc.) during the Jinhae Gunhangje Festival but a “must-eat” food is the cherry blossom bread (벚꽃빵), which is a Jinhae specialty. 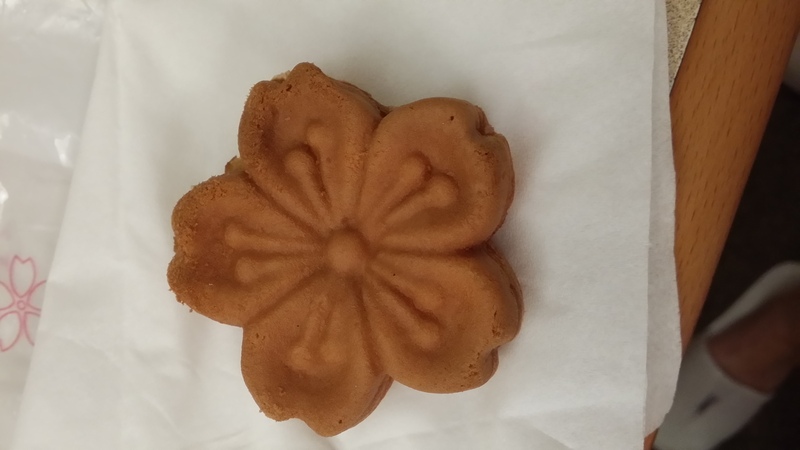 It is in fact a small flower-shaped cake made from egg, flour, cherry blossom extract and syrup. I like its taste – not very sweet but delicious. 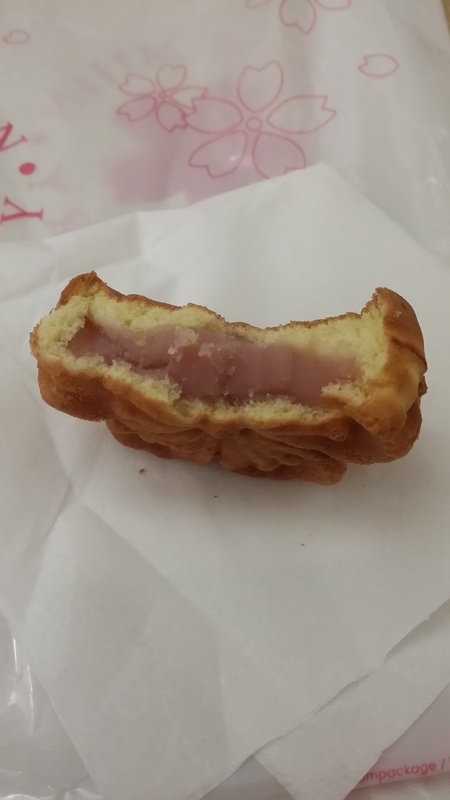 The cherry blossom bread is very popular among tourists – I queued for 45 minutes in order to buy it! Reminder: The next blog post will be published on 26 March 2015. Watch this space! Hey very nice website!! Guy .. Beautiful .. Superb .. I’ll bookmark your blog and take the feeds additionally? need work out extra strategies on this regard, thanks for sharing. Thanks for your comments. Happy to know that you like my post. Look forward to your continued support. Thanks for your comments. I can write further on this topic when I find more interesting information on this subject. Watch this space! Thanks for your comments. You may share my posts with your facebook group so long as you provide links or credit back to my blog. Happy sharing! Thanks for bookmarking my site. Look forward to your continued support. Thanks for following my blog. Look forward to your continued support. Thanks for your comments. I am using the wordpress free template – although I am not so knowledgeable in IT matters, as the wordpress is very user-friendly so set-up is quite easy for me. You definitely put a brand new spin on a subject which has been discussed for decades.